Authorised agents for LidgetCompton Garages. Suppliers of spares and accessories for Lidget Concrete Garages, and recommended contractor for repairs and refurbishment of Lidget and Compton buildings. 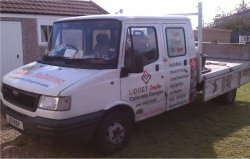 Nobody knows concrete garages as well as we do and Lidgetspares.com provides nationwide repairs, refurbishment, removal, and spares catering for all popular brands. We’re licensed to remove asbestos and we lay concrete bases. If it’s a new garage you require then click here to obtain an instant on-line concrete garage quotation. We specialise in repairs and spare parts for the Lidget Concrete and Compton Garages and the refurbishment all brands of concrete sectional garages including new garage roofs, fascias, replacement garage doors and windows. Additionally we sell concrete garage panels, we extend and widen existing concrete garages, and we will dispose of your asbestos roof in the appropriate and responsible way.